Dubai, UAE, January 13, 2019: The Grand Regulator in its distinctive 44 mm case has been a permanent fixture of the Chronoswiss collection for more than 20 years. In 2017, this classic watch was given an upgrade and has boasted its innovative 3D dial design ever since under the name of Flying Grand Regulator. In addition to this timepiece with its stainless steel case and midnight blue dial, two more Flying Grand Regulator versions in bold colour combinations will be launched this spring, each of them featuring a DLC coated case. At a hardness of 5,000 Vickers, a DLC (Diamond-Like Carbon) coating comes close to diamond and is extremely resistant to scratches or chemical influences. This process also gives the stainless steel case a dark, almost mystical look which is combined with different colours. Red and black: A strong contrast to the black DLC case, the dial glows in a bold red that was created especially for Chronoswiss and perfectly sets off the delicate guilloche pattern. A second shade of red, coral, on the hands and numerals adds variety. 30 watch lovers will be able to get their hands on one of these. 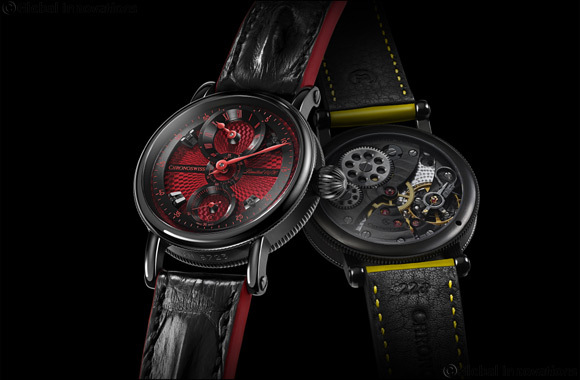 Black, yellow and red: The second new colour combination is equally dynamic, combining a deep black galvanized dial with a sporty anthracite DLC case. A fresh lemon yellow injects some colour alongside the red. Highlights on the dial and hands are mirrored on the striking alligator hornback structure strap. This combination is limited to just 15 pieces, so colour fans should not hesitate. The Flying Grand Regulator is set apart by its intricate dial design featuring several levels: While the lower one is decorated with the characteristic guilloche pattern designed at Chronoswiss´ in-house studio, a second level was designed over it on screw-fastened bases with the scale for the central minute display. The dial is topped off by the funnel-like displays for the hour and second floating above the minute scale. Chronoswiss’ love of detail and horological finesse is also revealed in the latest addition to the Regulator collection: There is a smaller counterpart under the minute hand that accurately depicts an inverse image of the areas of the minute scale on a central miniature scale. These are hidden from view due to the overlapping of the large scale with the hour funnel. This trick elicits light-hearted joy for the sophisticated design because the minutes can be precisely read. The aesthetically, sophisticatedly designed hand-wound movement is characterized by a second stop: Pulling on the crown triggers a slide that blocks the balance spring. Thus even the second hand can be stopped and precisely set. Finish Pallet, pallet-wheel and screws polished; plate rhodium-plated and with circular grain; bridges with circular grain; screws thermally blued. Strap Louisiana alligator leather “Hornback”; folding clasp with DLC coating.